Thank you to everyone that attended my Denver real estate investment seminar last night. I hope that everyone enjoyed the topic matter. I will be posting my slides over the next few days, and I hope to have another Denver real estate investment seminar at the end of this year. Hi Everyone ~ This is the blog article that you need to “comment” on to be in the running for one of the door prizes. Tonight (February 8th, 2012 at 6:30 PM) is the big event! 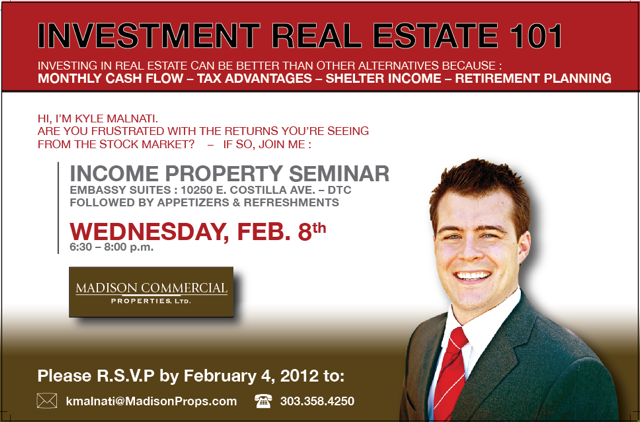 I will be hosting an apartment/commercial real estate investment seminar at the Embassy Suites in the DTC. We will have delicious appetizers, and great speakers for everyone to enjoy. This should be a fun, informative, and relaxing event. I really appreciate everyone who has responded with excitement and anticipation for my seminar; I’ve gotten a lot of great feedback. I can’t wait to see you all there! Also, I knew that I should share this article with everyone, because it speaks to how well Denver’s apartment market has performed recently. Apartment vacancy rates just hit the lowest year-end rate in 12 years! Its a great time to be an apartment investor, and I forsee that this will be the case for the next couple of years. REALTOR® Magazine 30 Under 30 Question #6: What has been your greatest challenge in real estate and how did you overcome it? REALTOR® Magazine 30 Under 30 Question #7: How do you incorporate technology into your business?